Have you ever been afraid to say “yes” to God? I have. Today I’m writing over at Proverbs 31 Ministries. I thought you could use the encouragement too. Let’s jump in together! I was sitting on the balcony, listening to excited squeals and splashes as children played in the swimming pool below. One particular little girl caught my attention. She appeared to be about 6 years old, wearing bright yellow water wings around her arms like blood pressure cuffs. As she stood by the pool nervously flapping her arms, her daddy was poised in waist-deep water with his arms outstretched. “I’m not going to move. I’m not going to let anything happen to you,” he assured her. This bantering went on for at least 15 minutes. I was amazed at the father’s patience and persistence. But finally, she jumped! Applause went up all around the pool! By the end of the morning, the little girl was swimming like a minnow and making her way across the once “treacherous” waters. Then God began to speak to my heart: Sharon, sometimes you’re that little girl. And suddenly, I began to see myself standing on the pool’s edge with my heavenly Father beckoning me to jump in. Come on, honey, you can do it, He coaxes. Go ahead and jump. I’m right here. Don’t be afraid. I’m right here. I’m not going to move. I’m your heavenly Father. I’m not going to let anything bad happen to you. First Corinthians 2:9 says, “However, as it is written: ‘What no eye has seen, what no ear has heard, and what no human mind has conceived’ — the things God has prepared for those who love him.” But in order to experience what He has prepared for us, we have to jump in. All through Scripture, we read of men and women who were afraid when God called them to jump into His plan. Moses cried out to the burning bush, “Who am I that I should go to Pharaoh and bring the Israelites out of Egypt?” And God replied, “Now go; I will help you speak and will teach you what to say” (Exodus 3:11b; 4:12, NIV). Jeremiah struggled moving forward with the words, “‘Alas, Sovereign LORD,’ I said, ‘I do not know how to speak; I am too young.’” But the Lord replied, “Do not be afraid of them, for I am with you and will rescue you” (Jeremiah 1:6, 8a, NIV). Gideon “flapped his water wings” and refused to jump in with several excuses. “But LORD … how can I rescue Israel? My clan is the weakest in the whole tribe of Manasseh, and I am the least in my entire family!” And God replied, “I will be with you” (Judges 6:15b-16, NLT). Moses, Jeremiah and Gideon finally jumped in the deep end of God’s will, and God did amazing works through each of them. The fear of “what if” holds me back sometimes. I wonder if it does you, too. What if He doesn’t catch me? What if I heard Him wrong? What if I fail? Allowing the fear of “what if” to mess with our mind and rule our heart will smother our confidence and courage with an avalanche of doubt. 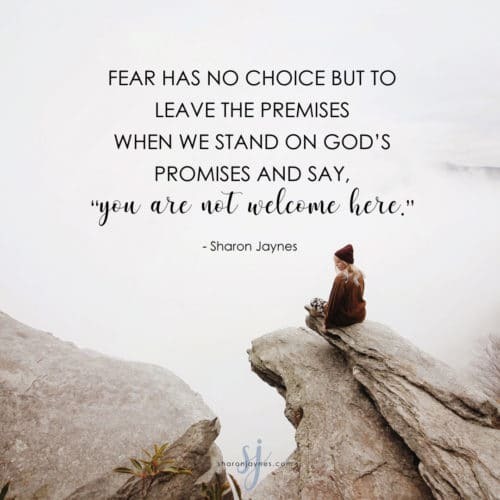 Fear has no choice but to leave the premises when we stand on God’s promises and say, “You are not welcome here.” Click & Tweet! Here’s what I’ve decided: When God calls me to dare greatly, I’m going to jump in with both feet, but never let go of His hand. I hope you will, too. “What no eye has seen, what no ear has heard, and what no human mind has conceived — the things God has prepared for those who love him.” Let’s jump in and experience those things together. Heavenly Father, sometimes I am so afraid to move forward in faith. Sometimes I’m not sure if it is Your voice or my own I’m hearing. But I’ve decided I am going to err on the side of obedience. Give me the courage to move when You say move, to speak when You say speak, to jump into the deep end of Your will when You say “jump in.” In Jesus’ Name, Amen. What’s one thing God is calling you to do, but you’ve been reluctant to take the leap? Leave a comment and share what that one thing is. Once you say it aloud, or type the words, you’ll be more likely to move forward in faith. Plus, we’ll be here to cheer you on. Leave my full time well paying job to focus on being home with my high school aged son while he does cyber school for the first time. I have a huge paramedic certification exam today, that I have wrestled with rescheduling for two days now. As I read this this morning I was reminded that I changed careers to follow God’s will and he will not fail me now. It’s been on my heart to attemd ministerial classes and the fear of remembering and finances as I have recently separated from my husband weighs on me. Please keep me in prayer as I lean on the Lord for direction in this new season of life single with my 17 year old daughter battling with her sexuality. I know, God knows He sees and I believe He’s going to bring us through IN HIS TIME. Although I’ve missed some days I’ve been truly blessed by Psalm Adventure. It has helped me tremendously in my transition. Thank you for allowing the Lord to lead you for He knew what I would need at this time in my life. I think He is calling me to write for Him. I’m afraid to leave my job for it is what provides for me and my son. I am so miserable with what my job entails. I’m scared that I will not get another job in the meantime therefore struggling to make ends meet. Thank you for this post Sharon. This was for me, I have been extremely fearful lately as The Lord has directed me to move ( with irrefutable signs and wonders) with my child almost 3,000 miles away, to a city I can’t afford on my own. I am an orphan and widow and have no one other than Jesus and my son. I have been petrified and full of doubt, not doubting that God is able, but doubting me, my ability to understand Him, hear Him correctly and afraid I will fail to do so and consequently end up ruining my and my child’s life. However, I identified myself with this message and feel this was the answer and confirmation I asked God for yesterday. So, I’m moving tomorrow, as The Lord directed, almost 3,000 miles away, as of today I have a little over $300, Please keep us in your prayers. I’m jumping in Aba Father! Please Jesus don’t let me drown! I decided to retire from my job after 40.5 years. I know even with social Security we will have less income, but I feel such a peace and some excitement as to what I have wanted to do and couldn’t before and what the Lord will have for me today. So yes, I have jumped in on faith. I have 5 children. The youngest 3 adopted. There have been struggles and joys. Here is our battle as of late. One of my sons have kidney disease that will soon require transplant. This son is also autistic….a scary combo. Another son has recently been in treatment and therapy for a severe concussion. Upon further digging we found he has MD in his biological family tree. His fiancé has left him stating she can’t handle this road. My daughter has learning disabilities and she has been bullied to the point of mentioning suicide. My husband and I knew we would quite probably never be empty nesters….but I didn’t realize it would be 3 young adults. I think God is asking me to go ALL in and bring our oldest home to recover and walk the new path and help heal his heart. I’m sure he is asking us to walk thru transplant. He is also asking us NOT to lose sight of our daughter in all of this. I’m terrible about asking for help because I’m usually the glue that holds it all together. I know that God is good. Prayers appreciated. 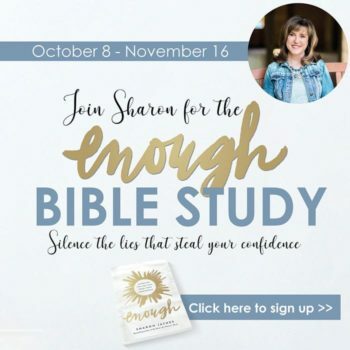 Sharon, I so appreciate your comments and encouragement to “jump in the deep end” when we sense the Lord calling us to move in a certain direction, but when fear gets in the way. I have OCD (obsessive compulsive disorder), and the gold standard of therapy for OCD is ERP (Exposure and Response Prevention). We are to face our fear and do the thing that we are fearing, and in my case, being a Christian, trust Him in the process. This is so difficult for me, especially when my fears center around the Lord and my relationship with Him. Do you know anyone that’s a Christian that I could talk to about this? OCD tends to be misunderstood by many, especially because only 2 – 3% of our population has this disorder. Thank you in advance for any help you could give me or another Christian that you think I could talk with. I wanna begin a Ministry for single moms in Nairobi, Kenya. I think God’s prepared me for this, but I’m just not sure. I really feel led to start a blog for Blended Families. But I don’t know anything about computers & it scares me to death. Leave the job. There’s something more. Thank you for this message. I believe God is calling me to be the Lead Minister/ Campus Minister at our 2nd church location and to move on with divorcing my husband who left me a year ago. I am read to Jumpi In because I know God will catch me! Trying to know if it’s time to quit my job (retire @ 63) and then what do I do? I know God has plans for my future I’m just not sure if this is the time. Really struggling with this. Right now i need to decide if accepting a position in the Christian Education Ministry of my church. I have a full time job, a home, husband, three sons, and im also doing my Bachelor. It is a lot. Plus I can pray more, fast more, etc. But i have served in the ministry for 10 years and i look at my life and I’m committed to this already. So i have thought about it too much. Im jumping in. The Lord will go with me. Thank you for this post. I truly appreciate it. Only after reading others replies and praying for them am I ready to share. I feel that God is leading me to go back to work. And I’m trying to figure any way around it honestly. I’ve been home with my toddler for years and leaving her (even with her grandmother or father just doesn’t seem right to me… for many many reasons). Please pray for me to be obedient to God. To KNOW that His ways are perfect and higher than mine, and that He can keep my little one in Jesus’ name.